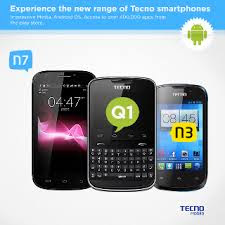 Mobile phone maker, Techno Mobile has rolled out its latest version of Android 4.0 Smartphones, the TECNO Q1 into the Nigerian market. Tailored for young individuals striving to stay connected to their network of friends, the 4.0 Smartphones which is fifth in the series of its smart phones, comes as a dual SIM capability as is the case with all TECNO smart phones. The device is through social media like Facebook, Twitter, Yahoo, Instagram and many more. Fitted with essential applications in a sleek modern design, the TECNO Q1 is a highly efficient and communication tool for better performance for active users who simply want more out of life. This stylish phone also allows for instant communication with contacts across the globe on WhatsApp and Skype. Boasting a 2.6” capacitive touchscreen, QWERTY keyboard, speedy 3.5G connections and a 5 mega-pixel camera with LED flash, the Q1 assures users of faster downloads of apps and games, better call quality, streaming video and audio services, and a swift “always on” connection. The new product helps its target audience take charge and control their lives as it gives them “the power to be you” with its speedy 3.5G internet and WIFI capability. The smart product gives users the opportunity to have have absolute control over who they connect with and how the connection is made, and also what information about themselves they are willing to share with the world. “They are the king and Queens of their world”, Mr. Boukali Mounir, Public Relations Manager, TECNO Africa, said. TECNO, a global company with its R&D centre in France and operations base in Dubai, produced the first dual SIM mobile phone brand on the market in Africa. TECNO has always transformed advanced technology into localized products with the guideline of “think globally, act locally”. TECNO always strives to pay great attention to customers’ experience and endeavors to provide them with the most suitable products, adopting the latest innovative technology. Currently, TECNO owns a comprehensive product portfolio, which covers mobile phones at all levels, including feature phones and smartphones. The company’s mobile has been highly praised and favored by customers for its high quality, powerful recreational functions, high-performance on Internet experience and favorable after-sales service throughout the nation. Now, TECNO, being the fastest-growing brand in Africa, has become one of the top three mobile phone brands in Africa.